Quartz Crystal Wands. These wands are polished from 100% natural quartz crystals mined from earth. Quartz crystal wands and crystal massage wands which can be used in different healing techniques like reiki, Feng shui and crystal healing, pranic healing. You will find crystal wands with inclusions and without inclusion. 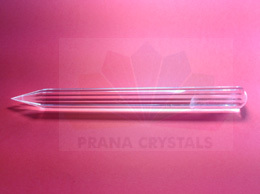 These crystal wands have their own consciousness and are very effective healing tools. 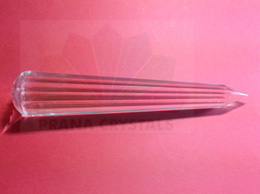 These metaphysical crystal wands are used in massage therapies. It is easier to do healing with the quartz crystal wands than our hands as the energy is more focussed and intense to remove the negativity and contamination from the affected area. 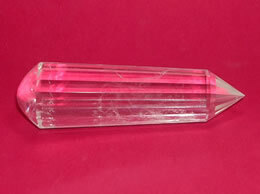 Thus healing with the quartz crystal wands helps to heal diseases like cancer, heart problems, kidneys, lung, throat etc. Healing with quartz crystal wands is more powerful as the Nature has bestowed quartz crystals mined from earth with healing properties.